I was reading Nature's Garden by Samuel Thayer recently when I realized that my backyard shrubs had been misidentified, and were covered with fruit that was perfectly safe for me to eat – autumnberries. Score! If you'd like to read Mr. Thayer's eloquent and passionate dialogue on the virtues of the autumnberry and it's uses, you can check out his post at the Forager's Harvest. He notes that the juice and pulp like to separate, that the plants are extremely productive (3,600–12,600 pounds per acre), and that the fruits are loaded with lycopene – about 18 times as much as tomatoes. Yup – that sounds about right. Autumnberries are now the most common edible wild fruit in the Eastern United States, so I vote we do our part to control them by eating more of them. Although most of my shrubs had been mowed, there were a few left around the edges with more than enough berries for Dunc and I to pick plenty for a batch of jelly. 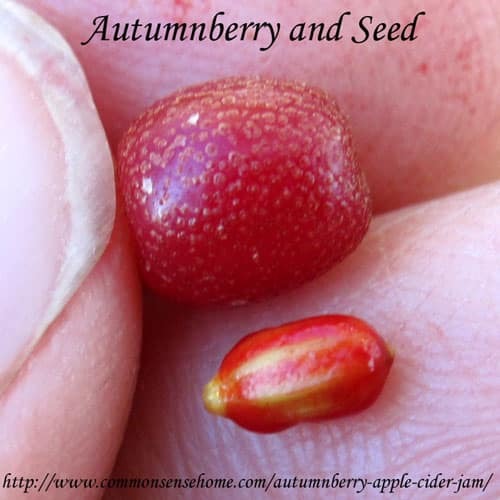 The autumnberry fruit is small (about pea sized) with a single, large oblong seed that takes about about 1/3 of the berry. The seeds are edible, but chewy. If you like pumpkin seeds with the hulls on, you might like these. The flavor is sweet, but mildly astringent. They remind me of chokecherries, but sweeter and milder in flavor. I was eating them by the handful as we were picking. I used Pomona's low/no-sugar pectin in this recipe, but you could use another low sugar type and adjust the recipe accordingly. Sterilize six 8-ounce jars, keep hot. Prepare lids. Fill water bath canner and bring to boil while preparing the rest of the recipe. 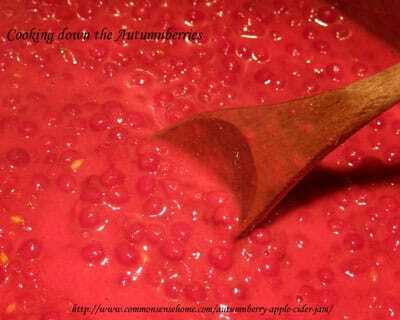 To prepare the autumnberry puree, rinse your autumnberries and place them in a heavy bottom pot with about a cup of water. Given the size of the seeds, you need a little over twice as many cups of berries (8-9 cups) to get 4 cups of puree. Cook until mushy. Run through a chinois or food mill, or squeeze through a jelly bag, flour sack towel or cheesecloth. I tried to use my food strainer, but the seeds were too big, so I had to switch to my chinois. Note: The pulp will want to separate from the juice as it sits. If you wish to make a jelly instead of a jam, cook down more berries, strain juice and pulp, and let them site overnight to separate. Slim off pulp and use for fruit leather or just eat it straight (it's very tasty). In a small bowl, mix together sugar (or honey) and pectin powder. Don’t skip this step, or your pectin will clump. Set aside. 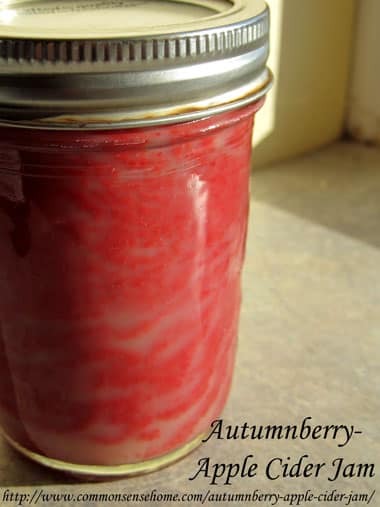 In a large, non-reactive pot (I use a heavy bottom stainless steel pot), combine autumnberry puree, apple cider and the calcium water. Bring to a full boil. Add sugar-pectin mixture, stir vigorously 1-2 minutes while cooking to dissolve pectin. Return to boil and remove from heat. Ladle jam into sterilized jars leaving 1/4″ headspace. Wipe rims clean and screw on the lids. Process for 10 minutes in water bath canner (add 1 minute for every 1,000 feet above sea level). Jam will last about three weeks once opened. Makes around 5-6 cups. This makes a soft spread that will settle out into layers in the jar, giving a marbleized effect, which I think is quite pretty. Since the lycopene is in the pulp, I didn't want to remove the pulp to get a clearer jelly. I figure I'll just give it a mix when I open the jars. You can drop the cider entirely if you like (the amount of pectin used normally gels 4 cups of liquid, but the apples and autumnberries both have some pectin), or add a little extra cider if you are short on autumnberries. If you would like more jam and jelly recipes, check out the jams and jellies section of the Recipes page, where we have over 15 different jam and jam recipes from currant almond to fuzzy navel to lilac and violet. Thank you for Liking, Pinning, Stumbling or otherwise sharing this post. 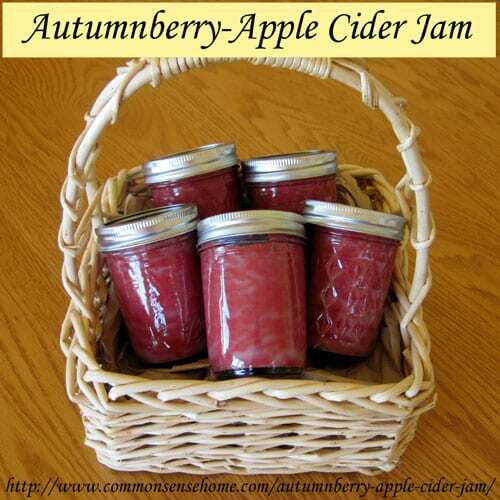 Wild harvested autumberries team up with apple cider to produce this tasty jam loaded with lycopene. Sterilize six 8-ounce jars, keep hot. Prepare lids. Fill water bath canner and bring to boil while preparing the rest of the recipe. To prepare the autumnberry puree, rinse your autumnberries and place them in a heavy bottom pot with about a cup of water. Given the size of the seeds, you need a little over twice as many cups of berries (8-9 cups) to get 4 cups of puree. Cook until mushy. Run through a chinois or food mill, or squeeze through a jelly bag, flour sack towel or cheesecloth. In a small bowl, mix together sugar (or honey) and pectin powder. Don’t skip this step, or your pectin will clump. Set aside. 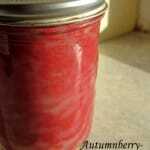 In a large, non-reactive pot combine autumnberry puree, apple cider and the calcium water. Bring to a full boil. Add sugar-pectin mixture, stir vigorously 1-2 minutes while cooking to dissolve pectin. Ladle jam into sterilized jars leaving 1/4″ headspace. Wipe rims clean and screw on the lids. Process for 10 minutes in water bath canner (add 1 minute for every 1,000 feet above sea level). The pulp will want to separate from the juice as it sits. If you wish to make a jelly instead of a jam, cook down more berries, strain juice and pulp, and let them site overnight to separate. Slim off pulp and use for fruit leather or just eat it straight (it’s very tasty). (I use a heavy bottom stainless steel pot). Jam will last about three weeks once opened. He also recommends using autumn berries for pies and juice in addition to jams, jellies and fruit leather. Years ago (1988), a friend of mine used them to mix with other fruit when making jam. Thanks for spreading the word about autumn olive – I’m waiting for a little more cold weather before harvesting. I’ve been gathering a lot of nettle this year from along a dry section of the Delaware Canal not far from me. Someone cut the banks to keep down the weeds and the nettles spring up thick and green the weather conditions this year are perfect for this). A 5 drawer Excaliber filled with about three pounds of fresh (I let them dry partway in my attic first) can be contained in a quart mason jar by crumbling them and packing them in. If folks have a favorite nettle spot this could easily be replicated to amplify the harvest. I enjoyed reading your recipe and also the way you documented the entire process. We’re also working with AO in New York and were wondering if you’d like to do a guest post on our blog about this amazing fruit. The company blog is still being set up but we’d love to provide high quality content about AO like what you’ve created and also direct traffic to the Common Sense Homesteading blog. Let me know if you’d like to try something like this out. I’ve only just started experimenting with them, but you’re welcome to share the jam post on your site with proper credit given. 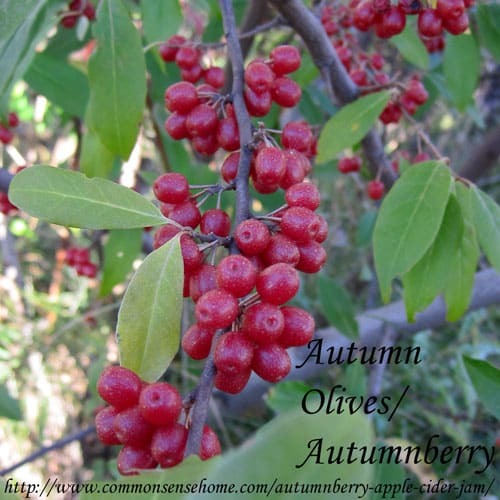 We’ve put together a site primarily about Autumn Olives and how people are working with them: http://www.autumnberry.org The name autumnberry, as you may know, was coined by the USDA and it seems to have some common usage. Thank you for this. I have several of these bushes in my yard and they were loaded with berries this year. I have picked and eaten some, but without knowing what to do with them, I lost interest. I hope the berries are still there. Hey I love the collection of recipes that you have and have been reading on your site. But I have not been able to find any Autumnberries in my area. Would you be willing so sell me a few of the seeds? I don’t have any seeds to sell, and some areas don’t allow the shrub to be imported because it can spread aggressively. Oikos Tree Crops sells the shrubs, but they are sold out for the season. I didn’t know Russian Olive berries were edible, can’t wait to find some to try! I have used Ball low-sugar pectin for decades, and I am curious was to the advantages of Pomona, if there is a difference. I like the convenience of opening the packet and dumping it in the pot, and in the early years the bone meal supplement for it didn’t appeal to me. Just to be clear, these are autumn olives (Elaeagnus umbellata), not Russian olives (Elaeagnus angustifolia). They are related species. Sure-Jell makes a low methoxyl pectin (available in the PINK box) in addition to its high methoxyl pectin (available in the YELLOW box). 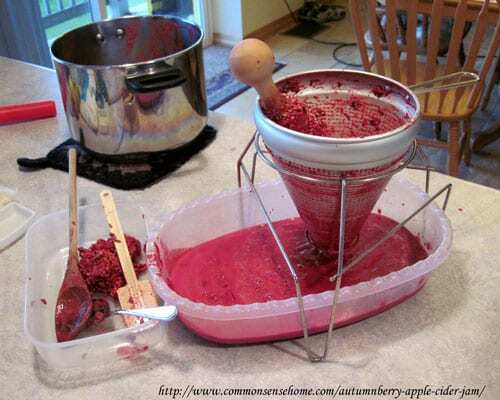 In the Sure-Jell pink box, the calcium has already been added to the pectin powder and stabilized with dextrose, so the cook doesn’t have an extra step in the canning process. Many people like the low-sugar Sure-Jell because that extra step is done for them. However, Sure-Jell’s “low sugar” recipes still use quite a bit of sugar ─ about 3 cups of sugar for every 4 cups of fruit. Many people would like to use even less. So they turn to Pomona Pectin instead. Pomona Pectin is the brand of low methoxyl pectin that will best accommodate low sugar recipes. This type is “amidated” through an additional processing step, which lowers the degree of esterification even more. Because of this, it is even more responsive to calcium for jelling, rendering the amount of sugar irrelevant except for taste. Thus, cooks using Pomona Pectin can use as much or as little sugar (including no sugar at all) as they prefer. Thank you so much for this recipe and information! I had never heard of Autumnberries before, but after reading this I quickly went out to look for them. I found a bush and picked the berries this morning, but now I don’t have any apple cider to make the jam. Will the berries keep in the fridge until tomorrow? Yes, they’ll be fine overnight. 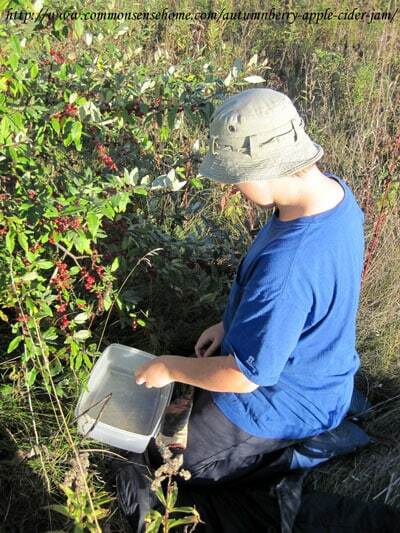 My name is Mariafernanda, I am a young scientist performing some research involving Palownia & Elaugnus umbellata. While searching where to buy 2.5 kg of its seeds I found your page. I saw this recipe and I would like to ask you if you could please collect me 2.5 kg of autumn olive seeds. Could you please inform me of the price and availability of such seeds? I must have them by no later than December the 20th, please respond at your earliest convenience. Our autumn olive season is long past, and this year we had very little fruit due to bad weather.